Well this is the most exciting Book Monster review for rather a long time. And I review a lot of very wonderful books, so that takes some doing. 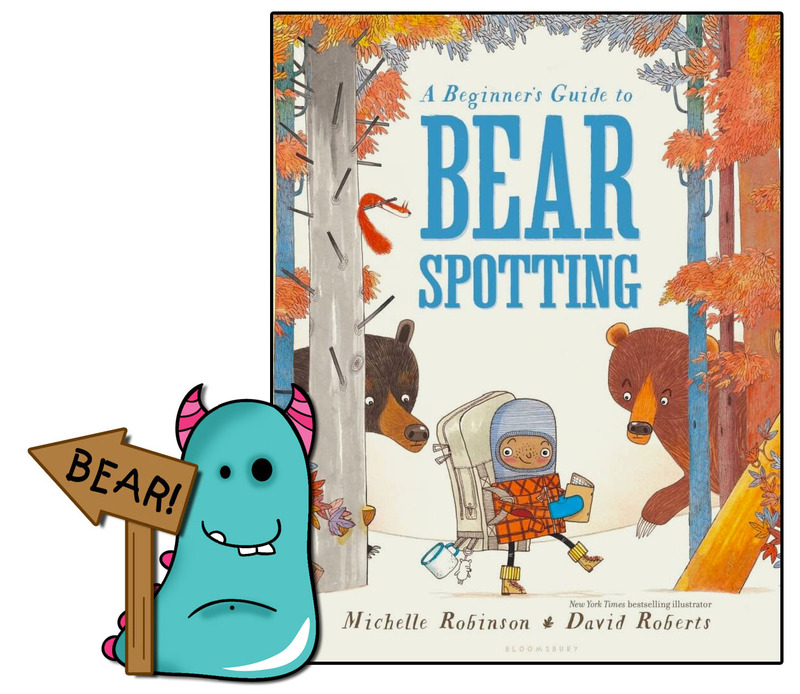 I have been fortunate enough to be sent an early release copy of the fantastic A Beginner’s Guide to Bear Spotting, written by Michelle Robinson, illustrated by David Roberts and published by Bloomsbury. Michelle Robinson is quite a writer, it’s true. She’s created fantastic books such as How to Wash a Woolly Mammoth, There’s a Lion in my Cornflakes and the brand new (review coming soon) Socks! Michelle has a wonderful writing style of her own which is quirky, hilariously funny and brilliant to read out loud to children. In fact for my most recent class visit to the library, I read Michelle’s book There’s a Lion in my Cornflakes and they LOVED it, every child gripped! We also have David Roberts talented illustrator of Pooh! Is that you Bertie?, The Flying Bath and Rosie Revere, Engineer to name but a few. David’s artwork is instantly recognisable and packed with expression and individuality! Quite a legend really. Pair one talented author with one also mega talented illustrator you get an epic and glorious picture book to kick off 2016!! 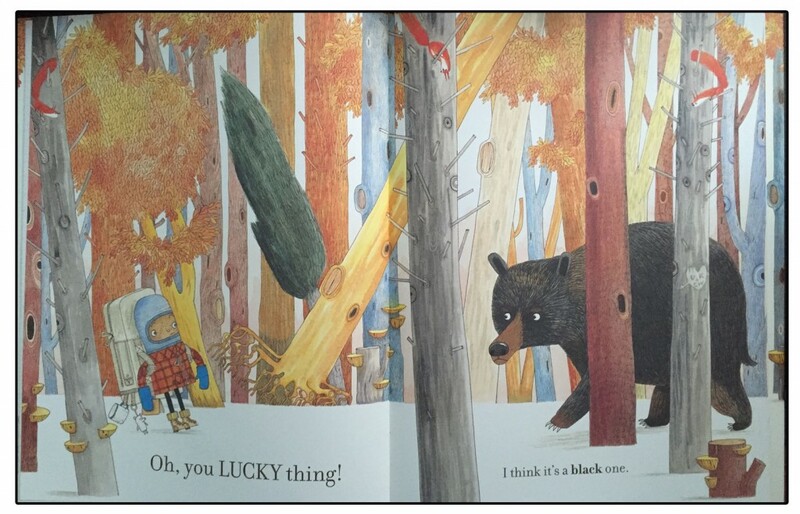 So A Beginner’s Guide to Bear Spotting, is pretty much a says-what-it-does-on-the-tin kind of a book. We are taken through the do’s and don’ts of bear spotting. From introduction to the different types of bear (frighteningly confusing for the amateur spotter) to what action you should take if you encounter one of these ferocious beasts! The book is written as if the narrator is talking to the main character, and when reading to children it’s ideal because you can ham this up spectacularly and pretend that they are the character in the book. David’s illustration of the child is quite non gender specific, so you could easily do this, even get the children acting out the different parts. There’s just tons of scope and fun to be had with this book. I’m going to be reading this on National Libraries Day to children in my library and I cannot wait!! A Beginner’s Guide to Bear Spotting is unique, it’s not a story as such, which makes it stand out and feel unusual, and much more fun to read actually. 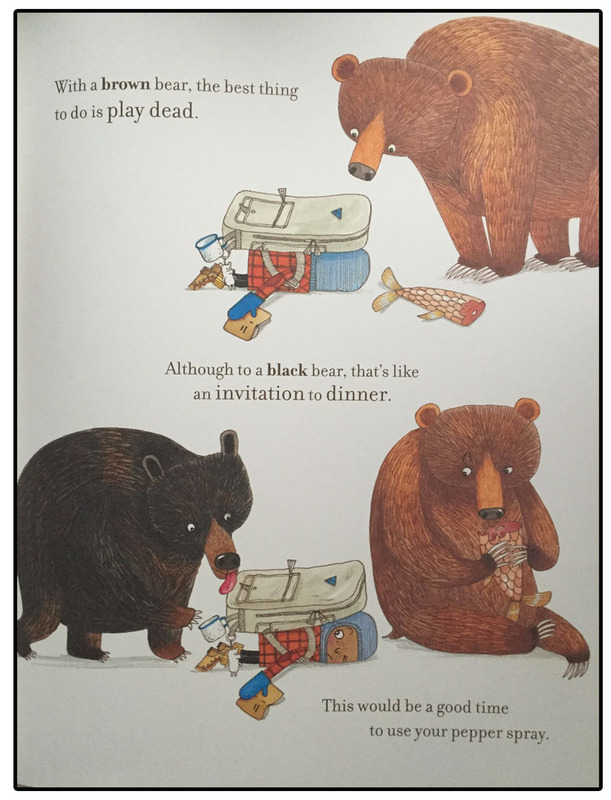 The illustrations support Michelle’s wonderful words so perfectly, I laughed out loud at certain parts, particularly when the child is told to play dead … just genius in every sense! David’s illustrations are sparse in terms of background detail, it does almost have the feel of an instructional book with graph paper backgrounds throughout, a Haynes Manual of Bear Spotting I suppose, and it works so well. Yet the illustrations are anything but dull, there is still lots of detail contained within the characters actions and expression and I love that you can focus on that without any other distractions. Occasionally a gorgeous forest scene is thrown in to brighten up the pages and it just works. Expertly done, and this is where a duo like David and Michelle are perfect together, neither over-do their work, putting in just the right level of detail be it through pictures or words, to get the best from the story and allow the humour to shine through. This is most certainly a book creating a buzz around the kid lit world, particularly on social media currently, and I’m not at all surprised, it’s quirky, funny, action packed, unexpectedly sweet, yet with a truly wicked twist a the end! 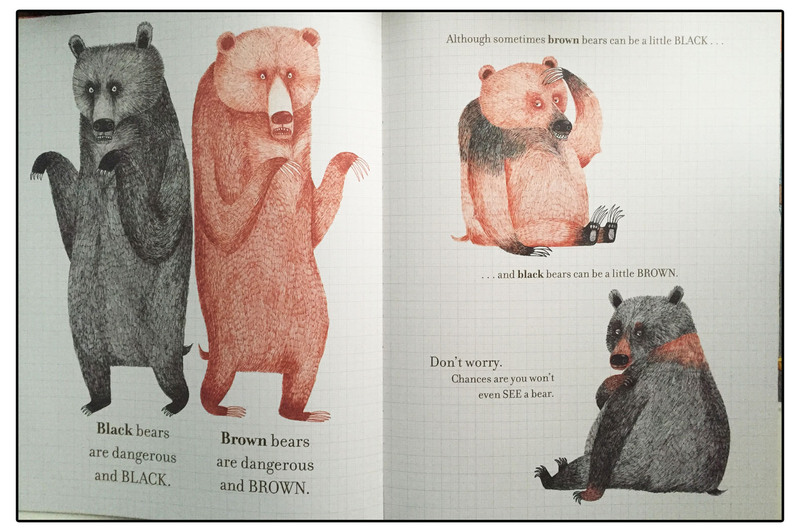 Thank you for spotting and then carefully reading this Beary Book Monster review.